Suevite in the Steinheim basin meteorite crater? – We mean no. Fig. 1. Polymictic impact breccia from the Steinheim basin. Sample width is 10 cm. Such a Steinheim suevite does not exist. In this context it is important to know that according to the impactite nomenclature referred to by the authors, a suevite is a polymictic breccia that contains shocked mineral fragments and cogenetic melt particles (see HERE and HERE). This of course implies that shocked mineral fragments and cogenetic melt are occurring in the same hand sample or in a coherent rock complex at least. This is clearly documented on our suevite web pages. But what is the situation for the Steinheim impact crater? 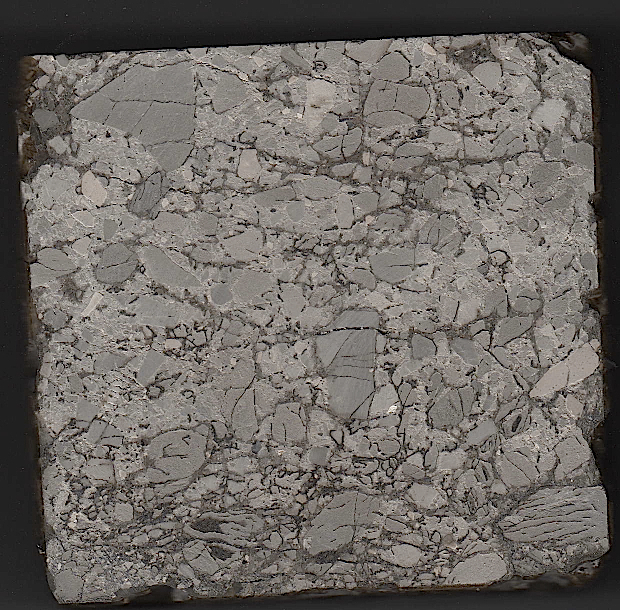 Macroscopic shock effects are well established by the occurrence of nice shatter cones, but shocked mineral fragments have only very sparsely been found. According to Heizmann & Reiff: Der Steinheimer Meteorkrater, München 2002, planar deformation features (PDFs) were observed in shocked quartz grains that had been washed out from drill cores of the basin breccia. In their article Buchner and Schmieder show PDFs, too, that however – take note! – have originated from borehole B 23. But the melt particles are described only for the borehole B 26. Consequently, there is not any indication of a cogenetic origin of melt and shocked minerals and, hence, of a suevite. It is not even certain whether the melt analyzed by Buchner and Schmieder is a shock melt at all. Melts in impact structures may form also by the enormous frictional forces acting between large rock complexes in the excavation and modification stages of impact cratering. Particularly in the Steinheim impact crater the formation of a big central uplift demonstrates that there were significant internal movements in the modification stage. In this case of a frictional melt we were even much farther from a suevite. Although Buchner and Schmieder found in the field a small 2 cm-diameter particle of a partly melted sandstone that allegedly contained faintly shocked quartz grains (nothing is written about the specific shock effect, and no image is shown), the Steinheim basin breccia does not metamorphasize into a suevite.